Wool is wonderful. It's comfortable and breathable. Knitters love it because the yarns possess a natural stretch. Above is a new wool fabric being made. It's actually descending from an industrial knitting machine in this picture; you're seeing it as it's being knit and temporarily stopped for inspection. The fabric hasn't had the chance to relax yet, so it's a little stretched out and stressed. But once it's rested, had a nice bath, and is thoroughly dry, the wool fiber will "full" a bit, the ripples in this fabric will be more pronounced, and the sweater knit will be ready for cutting and sewing. Most sewers know (or eventually learn) the importance of preparing fabric before cutting and sewing. Knowing how to prep is especially important with natural fiber fabrics. Beautiful wool fiber like all protein fiber has a layer of microscopic scales. If the fabric is tossed in the washer, the agitation will cause these scales to bind together; the wool will felt and shrink. High heat and tosses in a dryer will do the same to this material. Some wool fiber is preshrunk or pre-treated with a chemical solution to make the scales lie flat or to remove the scales from the wool. Wool made with these types of processes can often be machine washed and dried with little to no shrinkage or felting. Fabric care instructions must always be followed, especially with regard to water temperature and dryer temperature. Sustainable methods of producing felt-resistant wool are in development. Zigzag or serge any unfinished cut edges on the fabric. Add a small amount of mild detergent or soap to cool water in a tub or container. Be sure the container is sufficiently large to hold enough water to completely cover the fabric. Add fabric to the soapy water bath. Allow fabric to soak until fabric sinks to the bottom of the container. Squeeze out excess water by rolling fabric in a towel. Or if there's a large amount of fabric, place in a washing machine and run the gentle spin cycle only. Without stretching the fabric, lay it out flat on a mat to shape or on a couple of sweater drying racks [affiliate link]. Allow the fabric to find its size. In case you're curious about that fabric being knitted in the picture above, it will be available in the shop very soon it's currently out of stock. It's 100% wool. 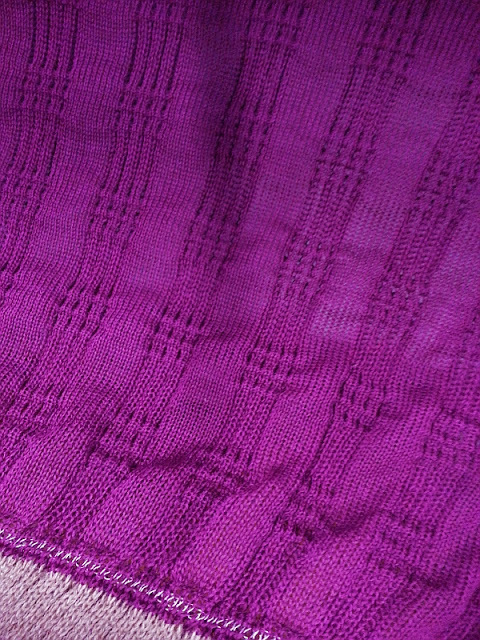 There's no way that I accurately captured the amazing color, because I photographed it under the knitting machine at the mill. It's kind of a deep raspberry in reality. Be sure to join the mailing list, if you'd like to know when this fabric is available and when I have sales! Ready to ship and custom knit fabrics are available in the shop now. They're so beautiful! No wonder you're excited! That raspberry sweater knit is gorgeous. I certainly don't need anymore fabric but I am seriously considering getting this when it becomes available. Thanks, Tomasa! I must admit I'm seriously in love with that color. 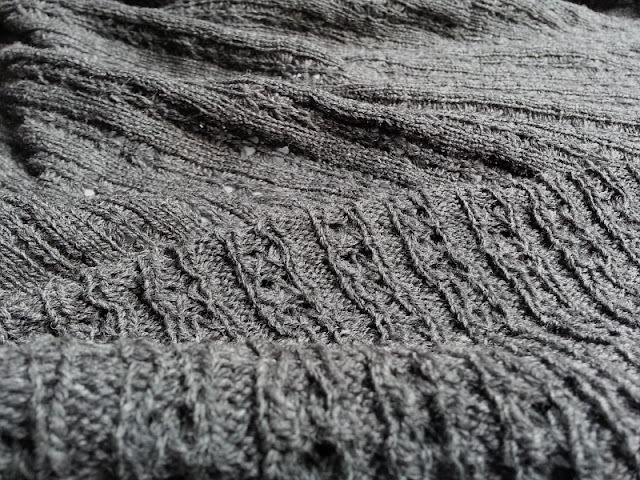 Hi, I love the charcoal and natural wool openwork sweater knit you have in your shop. If I wanted to make a sweater from either (or both!) what would I use for neck/arm bands? Thanks for any help. I want to have a plan in place before I order. Hi Georgine, I'm so glad you like the fabric. Thanks for asking the question about the bands. That happens to be the topic of my next blog post! Briefly put, I'd reverse the self fabric for bands, making sure to get the length just right. If I needed less stretch in the bands for my particular project, before cutting the band, I'd rotate the fabric 90 degrees so that the direction with the least amount of stretch goes around the body. Making sure to determine the correct length of the band and testing to see that the band fits comfortably over the head or hand is always important. Thank you so much for your quick reply. I am going to read over the link about the length. And, I have re-looked at all the knits you are offering and now can't decide. It is a good problem. Feel free to ask if you've got further questions! Also I hope to post more fabrics later this week.